When it’s on someone else’s dime it’s always bound to taste a whole better, right? Plus when it’s not your money you can order to your heart’s content. Well, that’s the case in most places, but not Ruth Chris. Let me start by saying it cost us $60 to eat there…..after our $150 gift certificate. Which is a lot, because as far as I can tell there is nothing fresh and local on their menu. That would explain Asparagus on the menu in November and the exact menu nationwide. Crabtini and Crabcakes with green peppers and celery. We started with appetizers. I remember getting there crab cakes years ago and loving them. So of course I order them again. Total disappointment. I loved that they are all crab and no breading, but they were really fishy tasting. Crab usually isn’t’ fishy tasting. The Crabtini was pretty much the same. 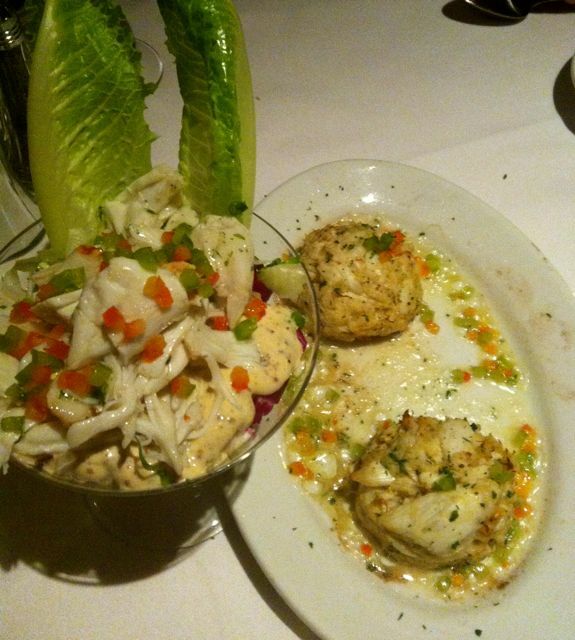 We ate both of them, but for crab cakes these days I choose Local Motives at $3 each as opposed to $10 each at Ruth Chris. 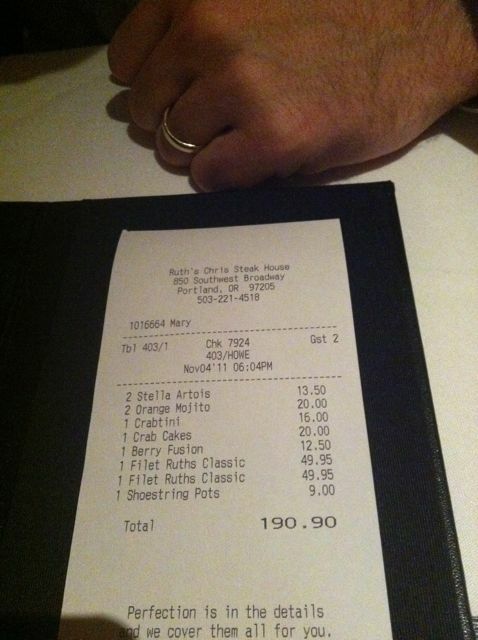 Ruth Chris is known for their steaks dipped in butter and placed on a 500? plate. 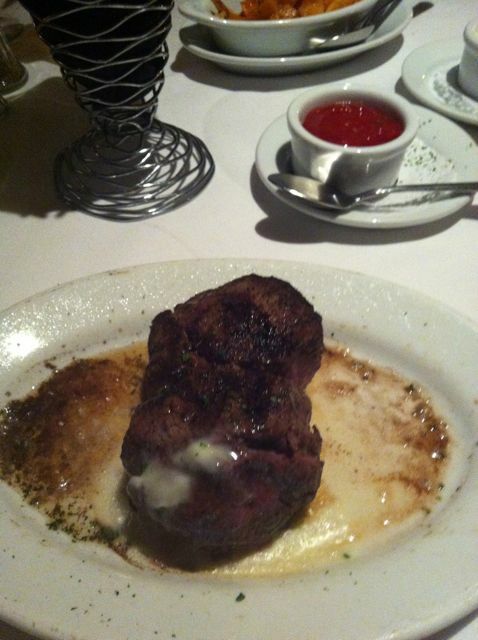 We both ordered filet, because we could. The steaks came out on a plate, but with nothing else at all. Presentation was beyond boring and the taste was marginal. Remember #3? 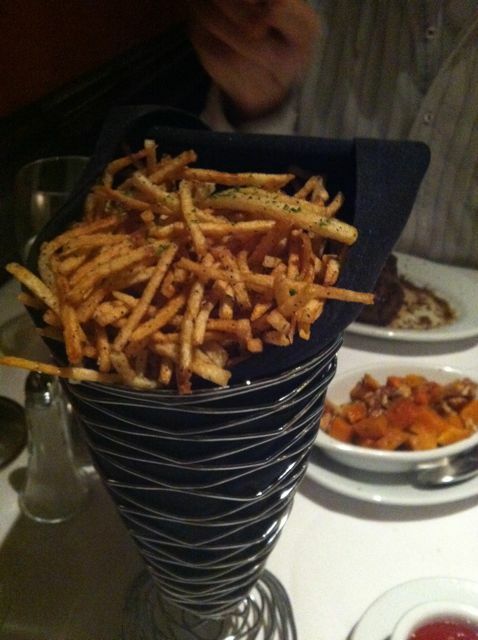 Shoestring Fries from Ruth’s Chris. Huge serving. We got the shoe string french fries and a side of butternut squash. Both were really good. 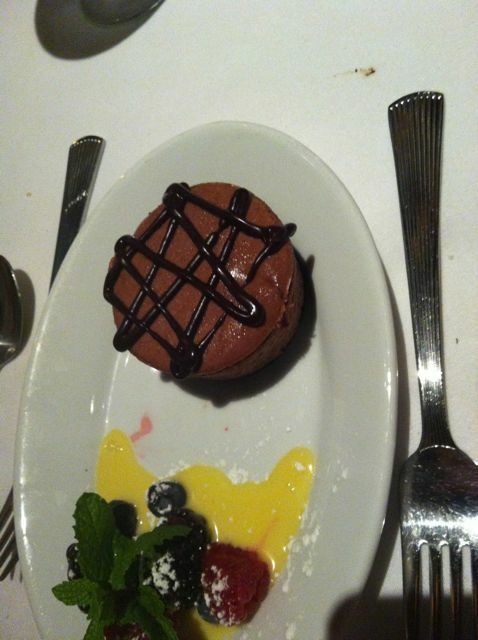 My husband ordered a meal that came with a dessert so we got chocolate cheesecake, that was fine. When you get a free meal it always tastes better, but this one just didn’t. It tasted marginal, at best. There was nothing that stood out and nothing that was so impressive I was wowed. When I pay money for good food I like to be wowed. Somehow the place was packed out. At $100 a person that place was making bank, but I guarantee you they weren’t eating as good as those that were at ClarkLewis, Sal’s Kitchen, St. Jack or even Zeppo. That’s just a few of many great places in Portland. You should see my favorites list. Atmosphere was very formal. Even in kick back Portland, you need to step it up a notch here. Pricing is off the charts expensive. At least $40 a steak and then you order side dishes separately. A baked potato will set you back $9. They do offer beer, wine and cocktails. We had beer and cocktails. They were fine. Calories are listed for everything, so that was good…I guess. Disclaimer :: I am not a photographer. Taking pictures anywhere is embarrassing, taking them here is very embarrassing. Unfortunately there wasn’t much to photograph.